Teens always seem tired, except maybe on Saturday night. As parents of adolescents, we’ve all been there. We encourage them to get sleep to be at their best: to get good grades, be sharp in school and at work, to stay awake and alert playing in goal and even to act polite at the dinner table. But there may be something more important that comes from enough sleep. That’s an immunization against injury. A recent study from Connecticut shows that athletes who slept “at least 8 hours per night were 68% less likely to be injured, compared with athletes who slept less. Interestingly, the level of sports participation, commitment in terms of hours of training and practice, number of sports, private coaching or an attitude of “having fun in sports” did NOT correlate with increased injuries. The study was reported in the November 2012 issue of Infectious Diseases in Children. (www.healio.com/pediatrics). No mention was made of types of injuries but we can be sure that head injury and concussion figure in this data. 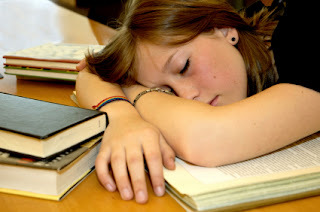 It’s startling to me when I review ImPACT tests on athletes at school, whether baseline tests or post-injury tests, how often students report 4-5 hours of sleep the night before. So in addition to making them prone to bad moods, inattention and trouble learning, we now can point out that lack of sleep may well have contributed to the injury itself. All this seems logical to parents who are perennially concerned about teens’ lack of sleep. But this might not be so evident to coaches, certified athletic trainers and athletic directors. Of course, “policing” or encouraging good sleep habits starts at home. But sometimes a student will hear the advice with a more open mind from a mentor on the team.